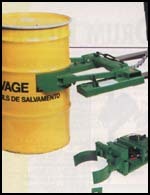 Economical and convenient way to tip, drain and store 55 gallon drums. Easy for one person to use. 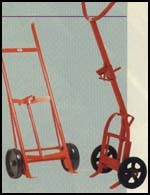 Models available with 2.5" polyolefin wheels, self-storing load tipping lever and swivel casters. Drip tray option available for all models. Heavy duty 1" structural pipe frames. High quality cast iron center moldon rubber wheel with 1" (ID) roller bearings. Polyolefin wheel is cost competitive and resistant to most environments that may damage rubber wheels. Engineered to handle 55 gallon steel drums. Mounts easily on forks--just hand tighten lock screws - No tools required. Pick up drums automatically, driver never leaves seat while lifting and releasing drums. Designed for a firm grip. Weight of drum holds grab jaws in place to minimize slippage. 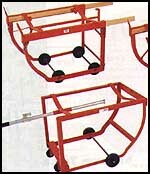 DJ and ADJ models have all welded steel construction for durability - no castings. Note: OSHA requires contacting the manufacturer of your fork truck for written approval for the use of any fork truck attachments.